WE NEVER SAW IT COMING. WERE WE THE ONES WHO FIRED FIRST? He asked himself these questions as if they even mattered. The night's sky, red as always, made him sigh. He felt lucky to be alive, but what kind of life was it really? Is there a way to move forward? Can we rebuild? Is there even a point? A worldwide conflict led to a series of catastrophes, and civilisation as we knew it ceased to exist. Humanity is now at the brink of extinction. In this apocalyptic future, you lead a group of survivors trying to maintain hope for the human race. Can you take the first steps toward restoring civilisation? 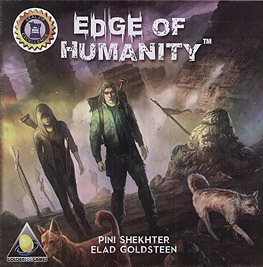 In Edge of Humanity, 2-5 survivors must make difficult decisions as they try to scrounge enough people and supplies to rebuild society. The game takes about 40 minutes to play and introduces a new take on deck-building, drafting, and hand management. Each round, a unique event presents hard choices that will challenge their attempts to survive, undertake perilous supply runs, rescue other survivors, and fend off desperate scavengers. Make the tough calls to save those you can. Bring humanity back from the edge, and give it one last chance to start over.